Recently I met up with a couple of Whiskey enthusiasts at Jack Rose Dining Saloon in Washington D.C. and as usual, tried a few single malt scotch whisky’s that I haven’t had before. Before I forget, the food, as usual was awesome! I had the Duck Breast, awesome, and a delicious appetizer the Chef whipped up for me special, many thanks!! So, the first dram was a Glen Garioch 21 year that was very reminiscent of the 12 year I have in my cabinet yet smoother and more refined. 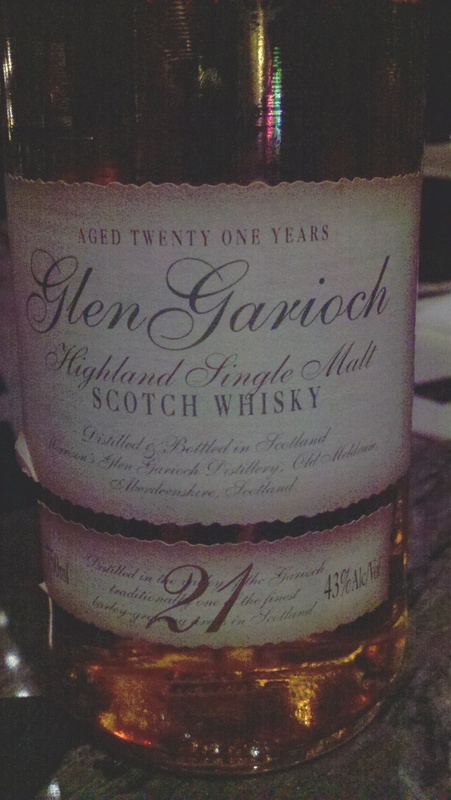 I thought the Garioch would go great with Duck and I proved this out to my liking. The most surprising aspect of this dram was that at 43% ABV it still had a nice little initial alcohol burn on the nosing. It of course went away as I kept my nose firmly implanted in it. A very nice fruity dram. Second up was the Prime Malt bottling I spied that turned out to be an aged Macallan which always interests me. As a rule, scotch that I can find almost anywhere on God’s green earth tends to not please me but The Macallan has yet to disappoint. 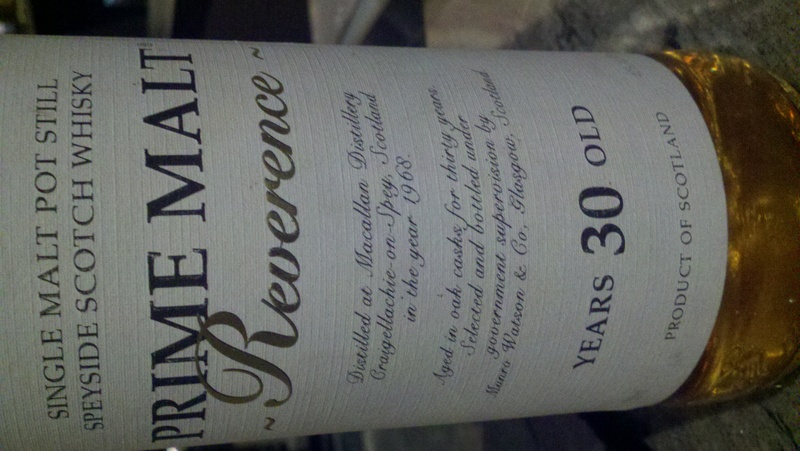 This dram was no exception and the 30 years of aging proved in-line with other aged Macallan’s I have had. It’s just a hard offering to beat, regardless of the bottler! At the urging of the bartender I tried his favorite single malt, which is saying A LOT, when you are at Jack Rose! So the Rosebank is famous and unfortunately rare since the distillery was closed in 1993. 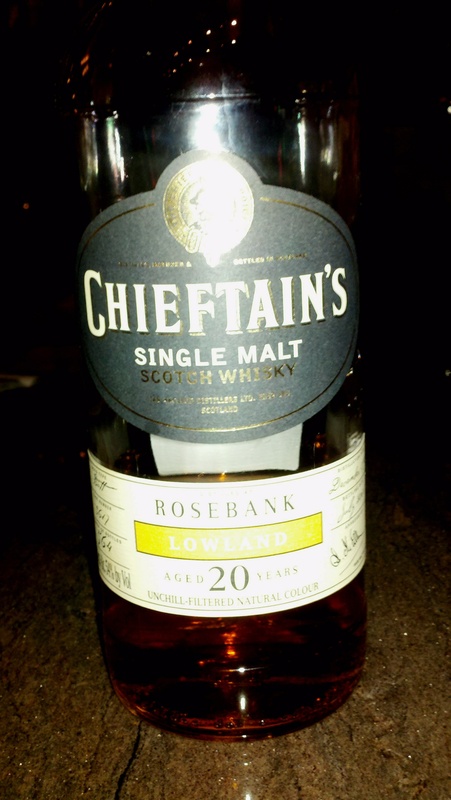 Chieftain’s offering from them was a 20-year-old (aged) and I can’t say it is my favorite dram at JR’s but it offers a very interesting experience. The flavors impact you first at the tip of the tongue and on the finish the flavors rush to the rear of your palate. Quite different, and I have experienced this before but it is not typical in my experience. I quite enjoyed it and it was probably the best dram of the three that night. So if you are reading this and find yourself in the Washington D.C. area, you also can find these fine drams (though drams like this are limited!) so get down there and imbibe! P.S.! If you were not aware, Jack Rose has a VERY nice humidor from Draper’s cigars and it is filled with Premium Cigars! All for $10! And between you and me, some are worth a LOT more than that! Smoking is allowed upstairs.